This is a dermaroller. Not sure if the Spanish Inquisition had them. 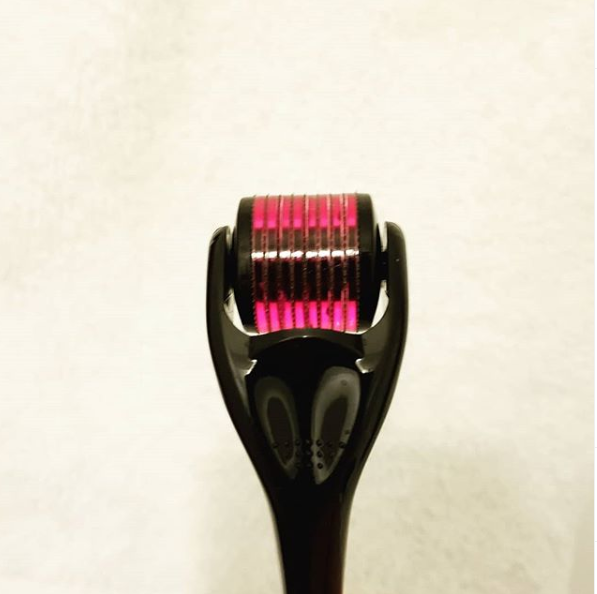 This terrifying little object is called a dermaroller. Of course, as with any criminal, it has an alias: microneedler. What does it do? It needles you, microscopically. You roll it across your epidermis. God, I love honest, descriptive names. This particular one is plastic with titanium needles, the smallest size, 0.25mm needles, so it doesn’t really penetrate into the skin very far, so hopefully I won’t end up with a Kardashian-like face full of blood. They go up to 1mm, which should only be used on the body, never the face: I bought a full set, 0.25, 0.5, and 1, but it’s doubtful I’ll ever use the other two, since I’m so thin-skinned you can see all the veins through my hide, and my legs look like a map of the London tube. Oh, and if you’re into such things, this is made of metal wheels, not individual needles. If the goal is to irritate my skin, a wheel should work better than needles anyway, and it’s about $50 cheaper too. The concept is, you irritate your face and the cells scream for help, and the body responds by making and giving those cells new collagen, which has a magical youthifying effect, the way you shut up a screaming child by popping a bunch of popcorn and stuffing it down their throats. What, you don’t do that? Anyhoodle, in addition to building collagen to fight middle-aged sag and wrinkling, the tiny holes also work as conduits for anything you put ON your skin, which is why it’s so important that both your skin and your needles be completely clean before you start. Some tough people put something on their skin beforehand so the needle pushes it into the skin, even skin peeling agents like glycolic acid, which to me just seems deranged. So tonight, after all my work was done and all my facebook fights were over, I put on some junky reality tv and cleaned my face, doused my microneedle with alcohol to sterilize it, waved it around for ten minutes until it was completely dry and clean, and then went to work. Ten strokes in one direction, ten at right angles to that. All over the face, then repeat at a 45 degree angle. You’re not supposed to push on it, thank god, because the idea of actively pushing needles into my face is not something I could ever be super-psyched about. Then, after was done, I looked in the bathroom mirror. I’ll spare you the 3am selfie in the filthy mirror (not mine), but trust me, it wasn’t pretty. I looked like I had a bad sunburn, and yes, there were a couple of red dots, very, very tiny red dots. I started with the serum, in this case The Ordinary serum called The Buffet, which is designed for people who can’t make up their minds, or just want everything in one serum, because by god, it has everything. It stung a bit, which is the lactic acid in it I suppose. Normally, it makes me a bit red, so tonight I should be incandescently red. Then, over that I put the Garnier night cream, Ultra-Lift Miracle Sleeping Cream, which certainly SOUNDS like it does something. It’s very soothing, I’ll say that for it. This is a jade roller, but it’s really only jadeite. Whaddaya expect for less than twenty bucks? 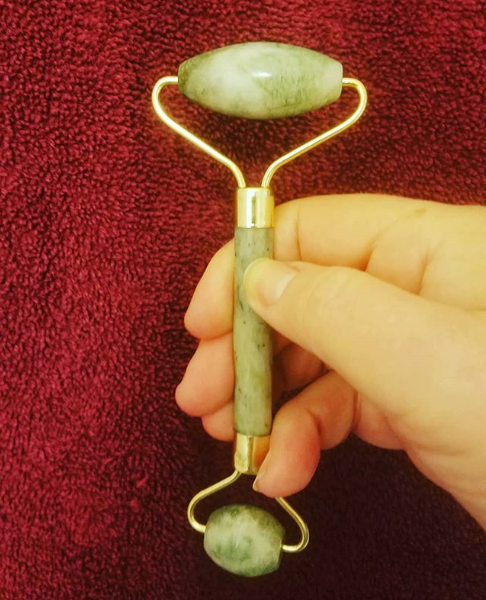 Then I took this device, a so-called jade roller, which is really a jadeITE roller, and rolled it back and forth the same as I’d rolled the dermaroller, but because it’s cool stone over rich lotion, it’s very soothing. This all done, I’m done for the night and will report back in the morning, god help me.